The tenth issue of The Total Rottweiler Magazine is being put to bed even as I type. Hmmm, do they still say “put to bed” for sending a publication to the printer? The printer is here in Illinois, just two hours southwest of me. But I won’t be arranging for a courier or driving flats or film to the printer myself. Our editor Jane is in British Columbia, finishing up last-minute page corrections and uploading them to the printer’s server. I’m doing the final check and approval on those pages as she finishes uploading them. Everything is done online. 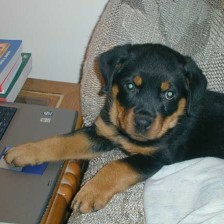 During the 17 years I have been in Rottweilers, many breed specific publications have come and gone. I still have fond memories of the original TRQ — The Rottweiler Quarterly. It may have often been way behind schedule, but the original owners always made good on subscriptions and advertising payments, one way or another. I can’t say the same for subsequent owners, and there are a few other now-defunct Rottweiler publications that out and out screwed over their subscribers and advertisers. So I’m not surprised there was a place for us — so many others have bailed, some with honor and others without any class at all. And I’m not surprised that Jane has been able to keep the magazine going. She is one of the most determined people I’ve ever met. Her past life in accounting didn’t hurt either. I think a lack of knowledge in that area is what sent some of the other magazines to an early demise. But it really did sneak up on me that we are just now finishing up issue number ten. Feels like a real accomplishment to hit that number! Rosie recently posted..Something exciting ! !